WELLINGTON, Fla.-April 6, 2017-Day two of the 2017 U.S. Open Polo Championship® saw Flexjet overtake Audi 10-9, while Coca-Cola claimed an 11-9 victory over Travieso at the International Polo Club Palm Beach (IPC). Through their last few games this season Coca-Cola has been working in super-sync. The team has been utilizing all four players, with patrona Gillian Johnston out front and the other three players rotating around and providing support. 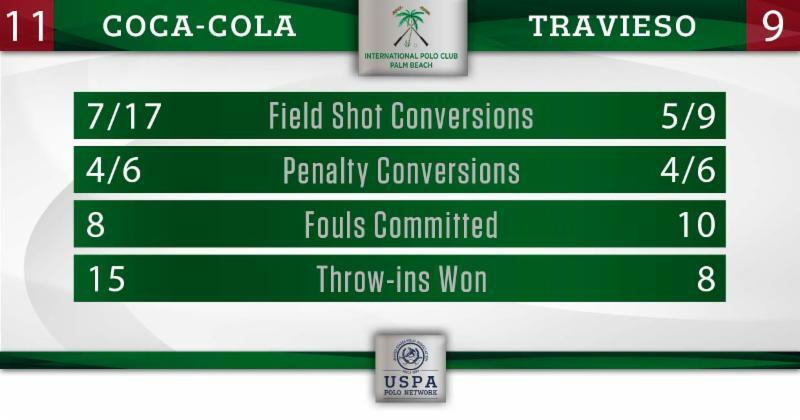 It showed early Thursday as Coca-Cola faced a Travieso configuration of Teo Calle, Sebastian Merlos, Mariano Gonzalez and Alfredo Capella, who were playing together for the first time.Two converted penalty attempts for Julio Arellano, along with 4 of 7 shots from the field converted through two chukkers, gave Coca-Cola the early 6-2 lead. Meanwhile, Travieso was still trying to figure out a game plan. With Capella hitting a long ball from the back, Merlos started moving forward. That led to back-to-back goals from Merlos as Travieso began to make their way back from the 7-3 deficit. After Coca-Cola committed a safety, Gonzalez’s penalty attempt seemed to be going wide. But a nice tip-in from Calle put the ball through the posts and gave Travieso some momentum. Two more penalty goals for Gonzalez, a very strong penalty shooter at 71% coming into the game, got Travieso back within a couple of goals. Gonzalez finished 4 of 6 from the penalty line for the game to lead Travieso with 4 goals. 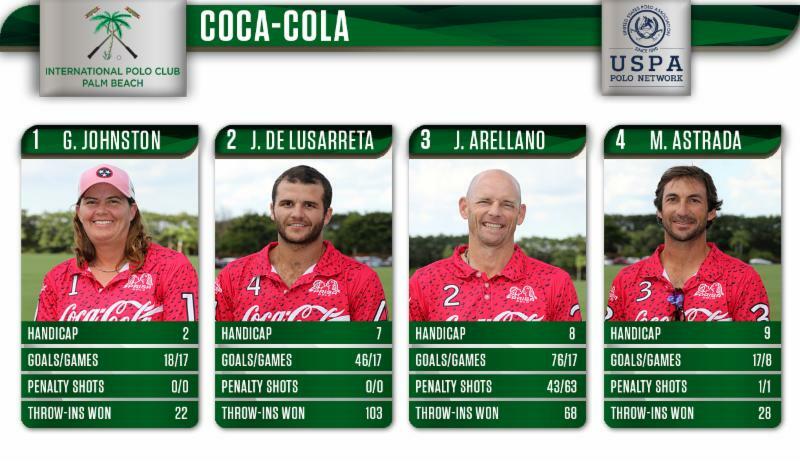 Coca-Cola continued to have a strong rotation with Arellano, Julian de Lusarreta and Miguel Novillo Astrada all coming forward at different times. But they couldn’t extend their lead, as they only made 1 of their final 7 shots at goal. Travieso tried desperately to come back, highlighted by a long run by Capella for a goal to get Travieso within 2. However, the early deficit was too much, as Coca-Cola played strong defense and were able to hold onto their lead and finish with an 11-9 victory. 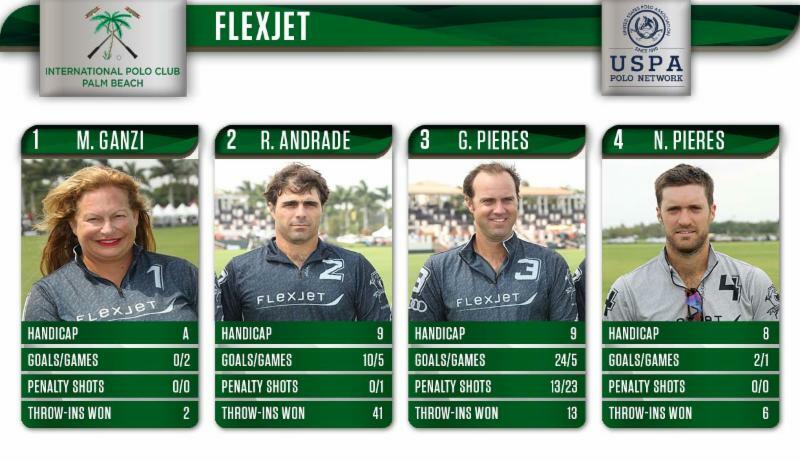 An earlier match Thursday featured the 2017 debuts of Nico Pieres for Flexjet and Alejandro Novillo Astrada for Audi. 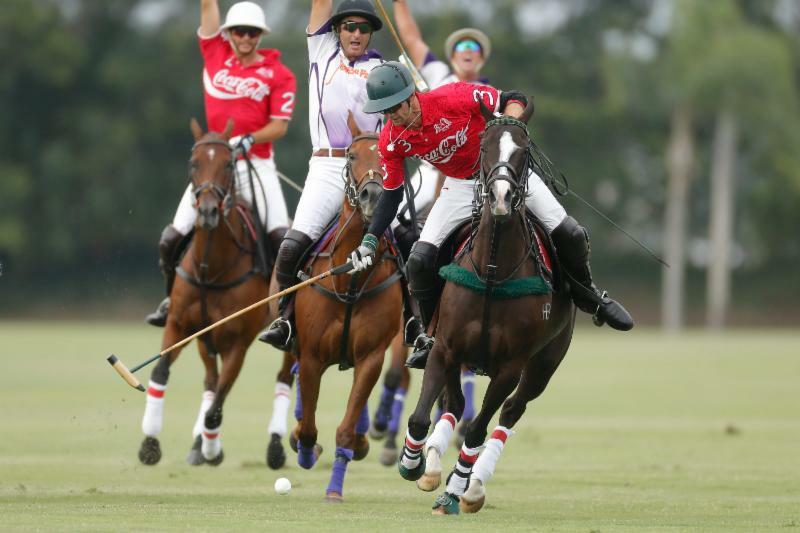 The trio of Nico Pieres, Gonzalito Pieres and Rodrigo Andrade made for a formidable combo. That led to Flexjet applying some early pressure. 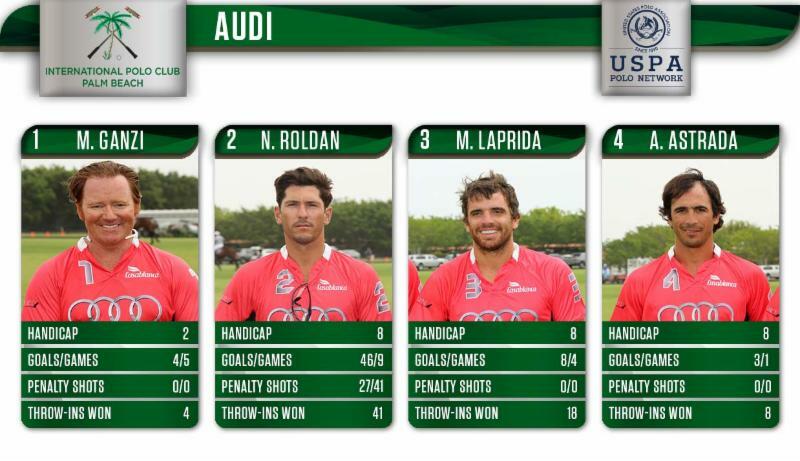 But they 3 missed penalty shots in the first chukker, allowing Audi to take advantage. Patron Marc Ganzi and Novillo Astrada made field goals to help Audi take a 2-0 lead. After their slow start, Flexjet started working more tightly as a team. 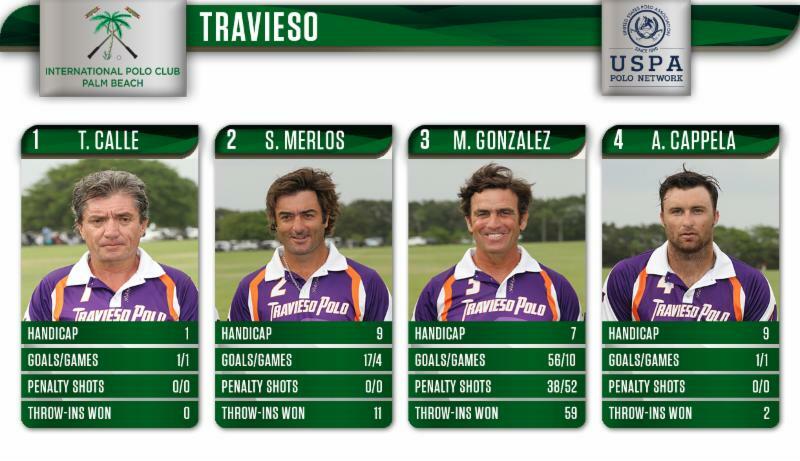 They scored 7 goals over the next two chukkers, with Gonzalito Pieres scoring 2 from the penalty line and 1 from the field. Meanwhile, Andrade and Nico Pieres added two goals apiece as Flexjet took a 7-5 lead into halftime. The new Audi team seemed to still be figuring out the role of each player, resulting in Flexjet producing more scoring chances in the first half (shooting at goal 10 times to Audi’s 7). While the fourth chukker was dead even, with each team making two goals, the momentum shifted in the fifth. Suddenly Audi was all over a Flexjet team that couldn’t seem to get the ball out of their own half. Audi shot at goal 7 times in the fifth chukker alone. But they struggled to put the ball between the posts, only converting 1 of those 7 chances. All of those missed shots resulted in 6 knock-ins for Flexjet, but each time Audi intercepted and fired the ball right back at goal. Flexjet only managed to shoot at goal three times in the entire second half, clinging to a slim lead as Audi continued to apply relentless pressure. Ultimately the difference was Audi shooting 2 of 10 from the field in the second half and 2 of 4 from the penalty line, missing too many opportunities around goal. Flexjet persevered for the 10-9 victory. Gonzalito Pieres led Flexjet with 6 goals (4 from the penalty line, 2 from the field), while Andrade and Nico Pieres each contributed two. All games in the 2017 U.S. Open are being live-streamed on the USPA Polo Network: uspolo.org. 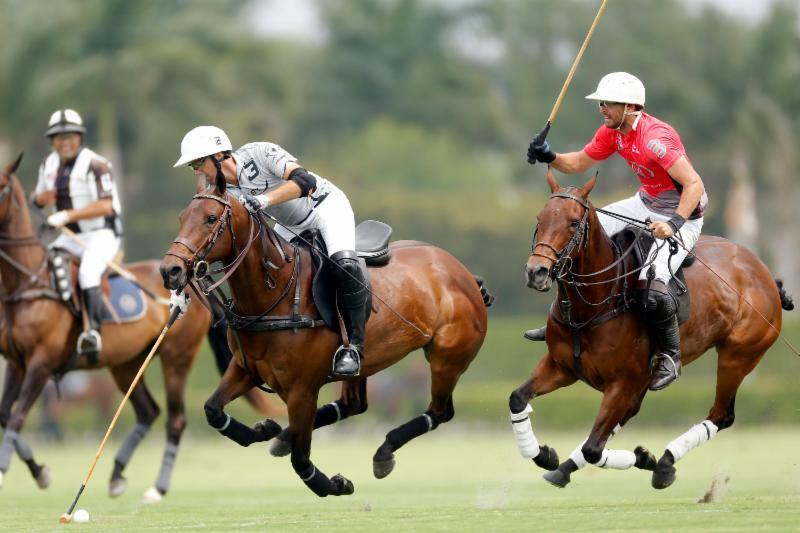 Game report, stats and photographs provided by International Polo Club Palm Beach.